glass layers. Like this the construction is protected against dust and humidity, which can permeate conventional filter and affect the image quality. 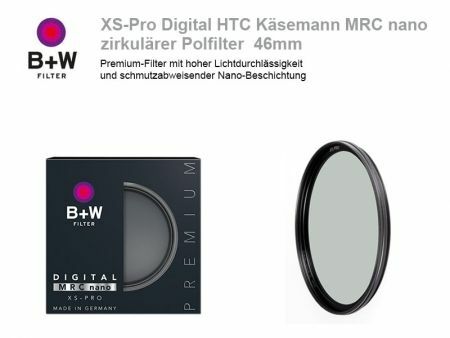 Furthermore the B+W XS-Pro Digital HTC MRC nano has an improved light transmission, so it blocks only 1 – 1.5 stops, instead of 2 – 2.3 stops like other polariser. Despite its slim construction, which makes it compatible even with wide angle lenses from 18mm / full format (12mm APS-C) , the filter has a front thread. It is build of solid brass, matt black chromed.